Claire and Jasper Beggs are passionate about their thriving hot air balloon business and know they're lucky to find such joy in their work and in each other. But while Jasper has accepted that he will never be a father, Claire has found it hard to come to terms with her infertility. She doesn't want Jasper to regret choosing her over a child in the years to come. Is there a way to give themselves a real chance at being a happy family? 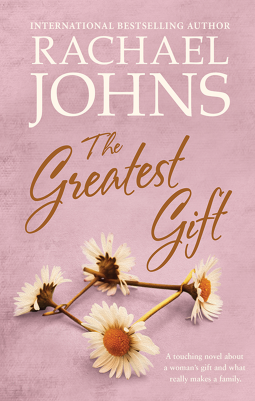 In her latest book The Greatest Gift Rachael Johns explores the issues of wanting children but being infertile and the amazing role those who make egg donations take on, to help those who have a strong desire to be a parent. This was actually a new idea to me, not sure why I hadn't heard of it before but I hadn't and so this book was a marvellous way for me to gain insight into it. Harper is a woman who doesn't want children and neither does her husband Samuel. However Harper does want to contribute and find deeper meaning in her life so she decides to explore the possibility of donating some of her eggs. Thereby creating the greatest gift. I liked the development of the characters, especially that of Harper - her journey was in the end the one that grabbed me. Jasper - husband of Claire, was another character whose reactions and feelings seemed totally believable. How they change and take up the challenges of the journey they are on made for some very good reading. I like the sound of this book. I have yet to read this author, but I'll be keeping an eye out for her books. Thanks for sharing. This sounds lovely and this is an author I've really been wanting to try. The story sounds a little like something Emilie Richards would do which is never a bad thing! Interesting subject for a story. I've never read anything about egg donation. I've read books that have touched upon it (by Debbie Macomber) but never anything that talks about it from the donors point of view! I have never read this author...thank you for sharing. Very nice review as always, Kathryn.